Parker 99R review - Let the butterfly opening begin! Parker 99R review – Let the butterfly opening begin! 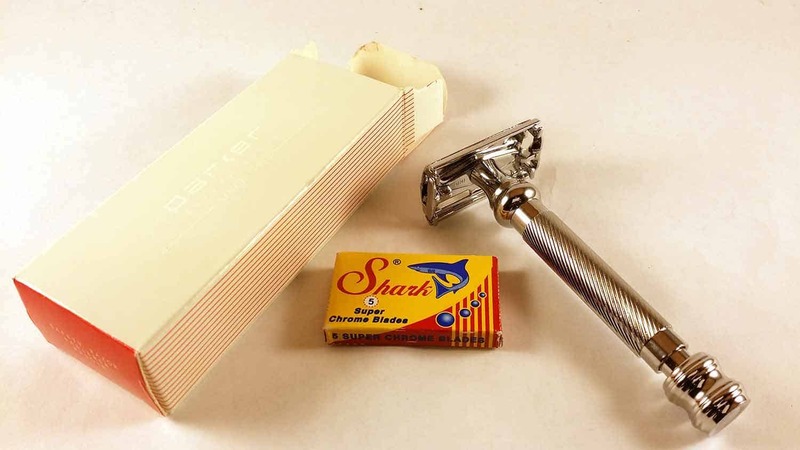 The Parker 99R reminds me very closely of the Merkur 180, not only in how it feels but also how it shaves. Out of all of the Parker safety razors that I have reviewed, this 99R is by far my favorite. It even made the list as one of the overall top safety razors. The biggest reason that I like it is because of how heavy it is as well as how long the handle is. I am slightly biased in this category because my hands are larger than most. The Parker 99R seems better crafted then it’s 22R and 90R counterparts. This is especially true in Parker’s newer 2010 model. It has a brass frame and is nickel plated so that it can withstand anything that you throw at it. Let’s get into the details of this razor! Also, if you are curious, here is the current price of the Parker 99R on Amazon. The balance of the Parker 99R feels very natural. It reminds me of the Merkur 180 except that it is a whole ounce heavier. The Parker 99R ways in at a heavy 3.4 ounces! Most butterfly open safety razors are top-heavy due to all the mechanical metal parts in the head (Types of safety razors and how they differ). The 99R does a very good job of balancing out the head by adding weight to the bottom of the handle. 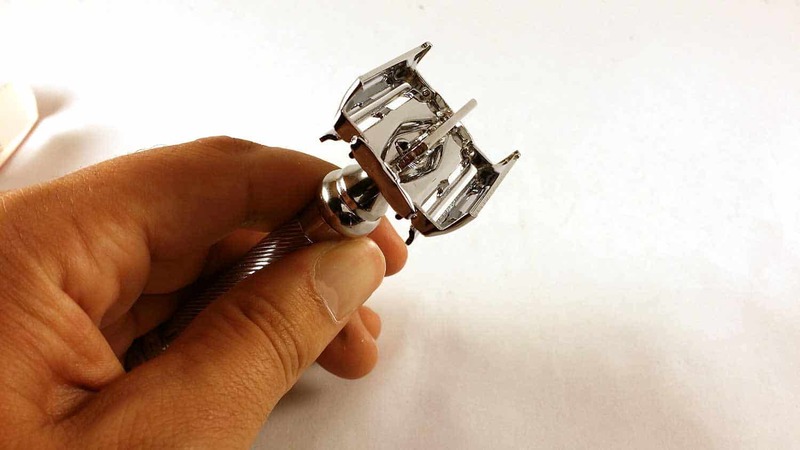 The safety razor seems to fall at the perfect angle for shaving when you hold it in a relaxed manner in your hand. It is is definitely on the heavier end compared to other safety razors on the market. Sometimes heavy safety razors do not work very well because they are not well balanced. But because the Parker 99R is so well-balanced, the added weight results in a extremely easy shave. The added weight also makes it seem much more well-crafted than other lighter safety razors. Butterfly open safety razors need to be extremely well-crafted so that they do not break. The Parker 99R has one of the best grips out of all the safety razors I’ve ever tried. This is a very good thing because it is also one of the heaviest safety razors on the market. The metal is textured by tightly woven vertical spirals around the handle. I’m guessing there is approximately 1 mm in between each groove. The spirals move in a clockwise fashion down the handle starting from the top. So if you are right-handed like I am your thumb will be perpendicular to the texture making an excellent grip on the handle. Even if you’re left-handed, grip is still more than sufficient. The total length of the Parker 99R is 4.0 inches. I personally like longer handles because my hands are larger than most peoples. With a long handle I feel yet I can wield the safety razor with more control and better angles than with a shorter safety razor. In general the Parker brand tends to make a more aggressive safety razors. I give the Parker 99R and aggressiveness rating of 9/10. In general I do not like to use safety razors that are this aggressive. I made an exception for the 99R because it is so well-balanced and you do not need to pull down hard while shaving because it weighs so much. I tend to get razor burn easier than most people, that is the main reason I do not use aggressive razors often. Check out my article about safety razor aggressiveness. Just like any other butterfly open safety razor, the Parker 99R makes it extremely easy to replace double edged blades. The knob at the bottom is extremely smooth while opening and closing the safety razor even after many uses. When twisting the knob to close the hinges, it forces the razor blade very tightly against the head (this is probably the main factor in why it is so aggressive). The mechanical hinge on the 99R is extremely well-crafted compared to other butterfly open safety razors. I have had other Parker butterfly open safety razors break on me because the hinges wore out over time. I am confident that this model will not have that same problem. Check out the complete list of the top safety razor blades. The Parker 99R is an extremely well-crafted butterfly open safety razor especially for the low price. The balance and the grip of this safety razor are absolutely fantastic. If you have larger hands like myself this will be a great tool to have because of how long the handle is. I cannot recommend this safety razor to someone who’s just beginning to wet shave because of how aggressive the shaving angle is. Besides how the safety razor functions, I really like the style and design of the packaging. It is very simple and reminds me of apple products. See what thousands of other current users have to say about it here! I hope you enjoyed my Parker 99R review and be sure to check out my other razor reviews as well as reviews on the top shaving soaps, shaving creams, and the best shaving brushes! Leave a comment down below if you have tried this safety razor or have any other questions! First of all, you have a wonderful site! Hats off Tyler! 1) Starting in 2010 Parker started using the head that you shaved with relative to the 99R on all of it’s Safety razors. The head and mechanism are extremely durable and reliable. 2) The 99R is not Nickel plated. It is Chrome Plated. There is a plating of Nickel over the brass, and then Chrome is plated over the nickel. This results in a great plating and also durability. 3) To reduce the aggressiveness of any razor, just angle the razor less. By holding the blade almost perpinduclar to your skin, this razor actually will become a very mild shaver. We encourage “newbies” to use this technique and almost pretend they are playing “shave the balloon” for their first few shaves.. The blade used also has alot to do with the aggressiveness. Brand new blades, obviously are sharper than those used for a few shaves. Some brands are much more aggressive out of the box than others. The trick is to find the blade that works for you. 4) The recently added Parker open comb models are being reviewed as quite mild shavers. (Parker 24C and 26C). They deliver the benefit of open comb razors (Close shave) without the aggressiveness open combs have been known for. Parker actually spent over 1 year to get the combination of mildness/closeness just right. Thanks for a great site here! Thanks for your added insight Howie! Much appreciated.